His absence lasted just for a year, now he is back in charge: Following a meeting of the Russian Handball Federation's Executive Committee, Evgeny Trefilov, who won four world championships with Russia's women's team between 2001 and 2009, has again been appointed head coach. He will now lead the team into the qualification for the EHF EURO 2014 in Hungary and Croatia, for which Russia face Germany and FYR Macedonia in Qualification Group 7. According to a statement on the Russian Handball Federation's website, which was published on Monday, Trefilov received five votes in his favour while four members of the Executive Committee voted against him. Trefilov had been dismissed from his post the previous summer following weaker results at the 2010 European Championship (Russia finished 7th), the 2011 World Championship (Russia finished 6th) and the 2012 Olympic Games (Russia finished 8th). 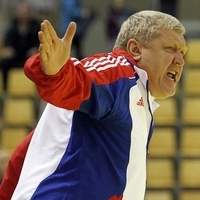 Vitaly Krokhin succeeded him, but he did not manage to put the team back on its successful tracks. He finished 6th at the EHF EURO 2012 in Serbia and then failed to qualify for the 2013 World Championship - a first in decades for the women's team. Krokhin's contract had expired this summer and was not renewed. With Trefilov at the helm, Russia's women had dominated world handball for almost a decade. He led the team to gold at the World Championships in 2001, 2005, 2007 and 2009. They won Olympic silver in 2008, silver at the EHF EURO in 2006 and bronze at the EHF EURO events in 2000 and 2008. Trefilov currently coaches Kuban Krasnodar in the Russian domestic championship. His first EHF EURO Qualification Matches will take place on 23 (in Germany) and 27 October 2013 (on home court) against Germany.